This unique home's Great Room features a 14 foot open beamed ceiling, modern tile floors and huge waterfront picture windows. Grill up some steaks on the Webber or whip up a gourmet meal in the fully equipped kitchen with state of the art Samsung appliances. Relax with a movie in front of the large natural stone propane fireplace. Feel the stress melting away! Retire for the evening in one of two water side bedrooms each with its own on suite bath. Enjoy your morning coffee on the wraparound deck, protected from the wind, and soak up the morning sunshine. Four miles north of Sequim, on a very quiet street, the new Water's Edge will meet your every need for a restful beach experience. We stayed again at the beach house and it was in just as good condition as in when it was new in 2014. The location is quiet and the views are west, north and east out into the Straight of Juan de Fuca. The views to the Northeast show a spectacular Mount Baker and the views to the Northwest show the spit and the New Dungeness lighthouse. Of course, it is exciting to see the spectacular cargo ships and cruise ships coming and going into the ports of Seattle, Everett and Tacoma. To get a glimpse of the mighty Olympic Mountains, just look out the kitchen window to see them towering over the farmlands of Sequim. The home is equipped with every thing you need for cooking and grilling. There is plenty of room in each of the bedrooms. Great for two couples and or a guys' weekend or small family. The open floor plan and lots of windows allow for relaxation and socializing as your desire. The deck and outdoor seating area with table make it easy to hang out for the morning sunrise or the evening sunset. It's a short drive 5 minute drive to Sequim and 20 minutes to Port Angeles. I recommend the beach house for any season. This house is STUNNING. 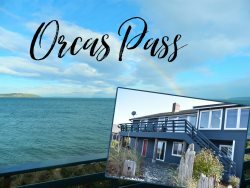 Right on the water, brand new luxury appliances, lovely propane fireplace, deck with grill, everything you could ask for in a northern WA beach front rental. Each room has an incredible view of the water. Also very close to Olympic national park landmarks. Can't wait to come back again!!! We loved the house, the location (waterside), the peace and quiet and the amenities. A wonderful spot for two couples to get away for a week or a weekend. This is the 4th house we have rented in Sequim over the last 10 years and we felt spoiled by this one. This has been my favorite vacation house ever. I woke up each morning looking and listening to the ocean's waves crashing on the shore. This house has the coziness of a cabin but the modern feel of a mansion. My family and I will definitely come back soon! We had a wonderful stay at the Waters Edge. A little bit of paradise. So peaceful. Enjoyed seeing the seals and variety of birds. Thank you for having binoculars on hand. We hope to return. ***Please note that the nightly rates on this property are based on 2 guests; Additional Nightly Guest fee per person will be added up to 6 guests max.